Anti-War Movement Says No to War and McCain | Fight Back! 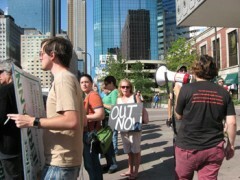 Minneapolis, MN - Presidential candidate John McCain was met by 100 anti-war protesters and trade unionists at a fundraising event at the Minneapolis Hilton, June 19. The demonstration was organized by the Anti-War Committee. Picketers outside the hotel delayed those attending the event. Speakers promoted the upcoming march on the Republican National Convention. In addition to calling for an end to the Iraq occupation, some protesters carried banners calling for an end to U.S. intervention in Colombia.